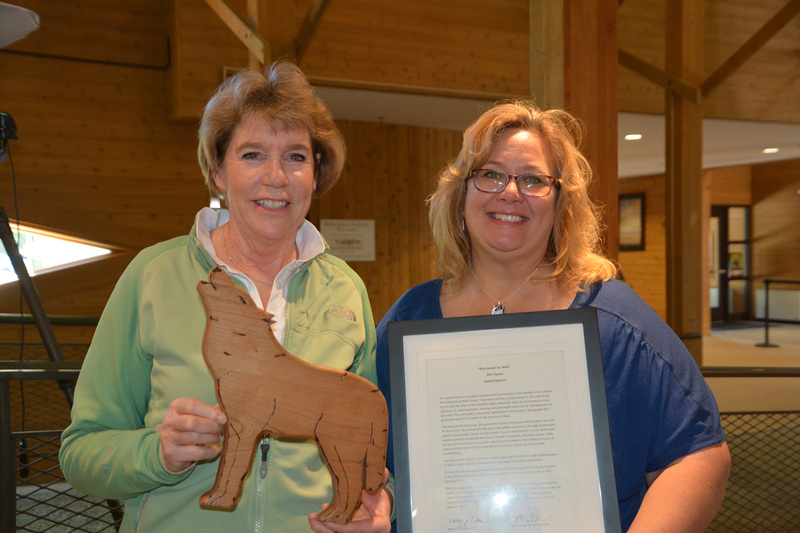 The International Wolf Center Board of Directors is honored to present the 2017 Who Speaks for Wolf award to Heidi Pinkerton. For all she knew, Pinkerton’s role was a simple one at the International Wolf Center during a beautiful summmer afternoon in Ely during 2017. She’d been asked to come by the Center to take some updated photographs of the non-profit’s board of directors at their summer meeting. What Pinkerton didn’t know was that the board had a big surprise up its sleeve. As the group was preparing to leave an exhibit area at the interpretive center in Ely, board member Nancy Gibson spoke up. She started reading from some notes and Pinkerton’s name kept coming up. It was at that point Pinkerton realized she was in for a big shock. 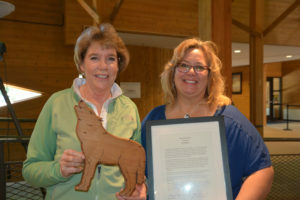 She was being presented with the organization’s Who Speaks for Wolf award for her tireless work over the years. Pinkerton was taken by surprise when presented with the award. With a beautiful collection of Pinkerton’s images serving as the backdrop, Gibson spoke about why Pinkerton was chosen as the 2017 recipient. “That was the neatest part,” Pinkerton said. “I was recognized for not only my love of the wolves, but for how I can help educate people through my photography. I think that when you educate people about wildlife, they’ll have a greater respect for it. In May, Pinkerton’s photos of last year’s pups (Axel and Grayson) were installed in the Interpretive Center’s seasonal gallery. Those images will be up in the gallery until April 2018. Pinkerton played a key role in documenting the arrival of Axel and Grayson at the Center, as well as their first year in Ely. Pinkerton grew up in southeastern Wisconsin and moved to Babbitt in 2009 with her husband, Tom. They had been living in Woodbury, but wanted to get closer to nature. She visited the wolf center several times over the years and took a real liking to one of the wolves there, Maya. Tragically, Maya died in 2011. Pinkerton read the sad news on Facebook and decided that night to have some time to herself. She had heard that the forecast looked good for the Northern Lights to make an appearance, so she went to Moose Lake and walked onto the surface of the frozen lake under a canopy of dancing multi-colored lights in the sky. In the distance, Pinkerton heard a lone wolf howling, something that stopped her in her tracks. The scene and the sounds left a lasting mark on Pinkerton. She taught herself that night how to photograph the Northern Lights and ended up making several outstanding images during the show. One of them she titled “Howling from the Heavens.” That print was donated to the wolf center in memory of Maya and from there, her involvement in the center quickly grew. Nowadays, her photos are everywhere in the Interpretive Center. She has the temporary exhibit space to display her photos of Axel and Grayson. In addition, several of her Northern Lights images are on display. Her photos are up on signs in the Center and have been used in the Center’s quarterly magazine for members, International Wolf. She has wholeheartedly embraced the center’s goal, which is to advance the wolf population through education. The International Wolf Center annually presents the Who Speaks for Wolf? award to an individual who has made an exceptional contribution to wolf education in the past year. This contribution may be made by teaching people how the wolf lives and by placing the wolf in the broader context of humankind’s relationship to nature, or by making an exceptional contribution to the International Wolf Center to aid us in our educational programs. The phrase “Who speaks for Wolf?” comes from a Native American lesson about a young man, Brother Wolf, who believed it was possible for his tribe to live alongside the wolf, instead of becoming a people who killed the wolves for their own convenience. Brother Wolf believed that someone should speak for the wolf when his tribe made decisions that would affect the wolf’s land and life.